In early 2015, an extensive outreach and consultation process will also be undertaken around key national, regional and global events to inform the updated Global Strategy. 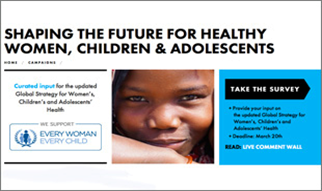 These consultations along with the surveys will be done in two rounds: Round 1 (Feb-March 2015) will ask stakeholders about their priorities for developing an updated Global Strategy for Women’s, Children’s and Adolescents’ Health. Round 2 (April-May 2015) will seek inputs on the first draft of the proposed Global Strategy text. The updated Global Strategy which is being developed by a wide range of national, regional and global stakeholders under the umbrella of the Every Woman Every Child movement will be accompanied by a first 5-year implementation plan to be finalized in May 2016. t is envisioned to be an impetus for change and ensuring a better future for women, children and adolescents the world over. This first round survey on the updated Global Strategy closes on 20 March 2015.